When the days start getting a bit cooler, I love to make more comfort food type recipes. 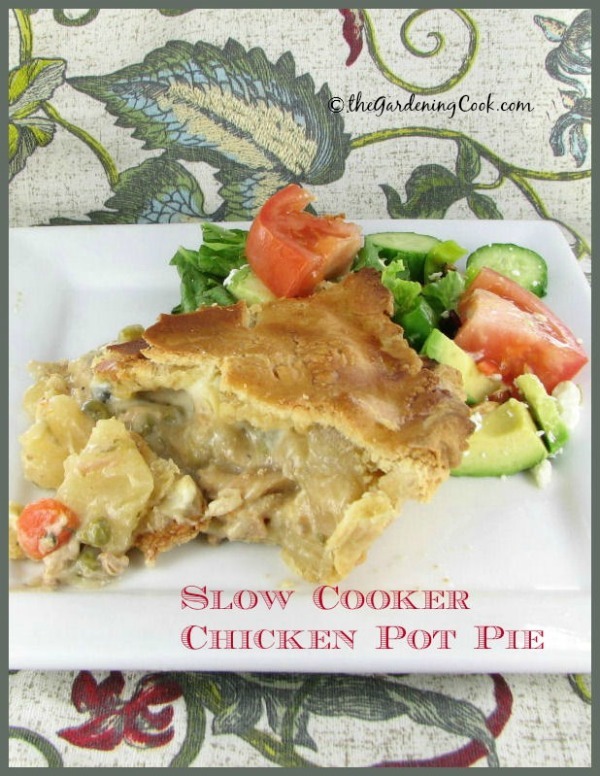 This recipe for Slow Cooker Chicken Pot Pie is a traditional favorite of mine and makes a great addition to my growing list of crock pot recipes. It used to be that when the days get colder, my crock pot started getting regular use. Now, it seems, I used it pretty much year round. There are so many different things that you can cook in a crock pot now. Crock pot cooking really can make things a lot easier in the kitchen. 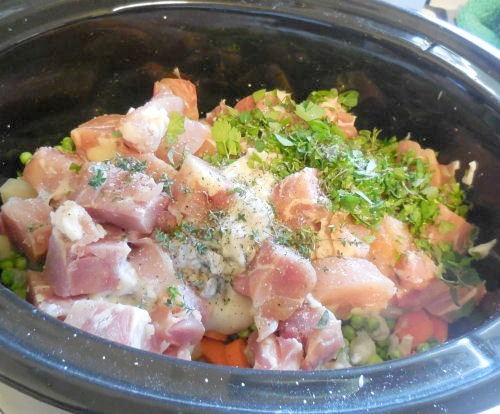 How do your slow cooker meals end up? 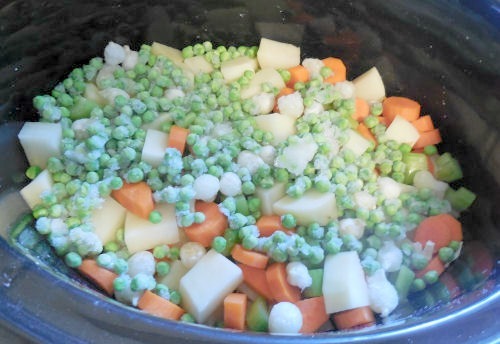 If you are not satisfied with your results, you may be making one of these crock pot mistakes. For today’s meal, I use boneless, skinless chicken thighs for this dish. 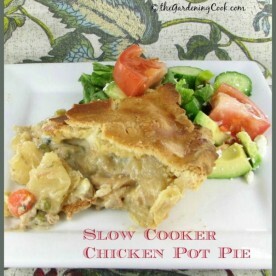 They are so flavorful and cook beautifully in the crock pot and it saves me loads of cooking time at night. The filling cooks all day and then can just be added to thawed out deep dish pie shells and cooked in a flash. Partly defrost the chicken and place the potatoes, and vegetables into the crock pot. Cut the chicken into chunks while still partly frozen. Dice up the fresh herbs. I used parsley, thyme and oregano. 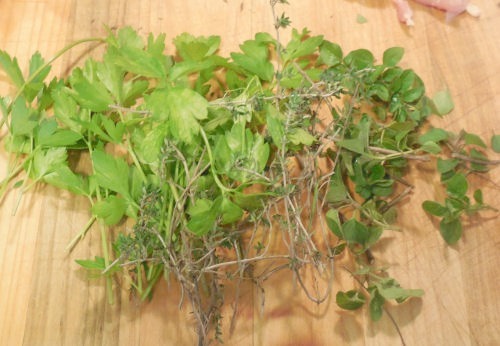 You can use dried herbs but I have tons of fresh on my patio so I love to use them. Stir in the cream of chicken soup and spices and mix well. Add additional salt and pepper if desired. Cook on low for 6-8 hours until chicken is fully cooked. Use a sturdy spoon to break up the chicken after cooking if the pieces are too large. About 15 minutes before you are ready to prepare the pies, stir in the heavy cream mixed with arrowroot and continue cooking. Spoon chicken filling into the bottom pie crust and top with the shredded cheese. (I used Cabot cheddar cheese today.) (affiliate link) The dish also works well with their 40% reduced fat cheese. 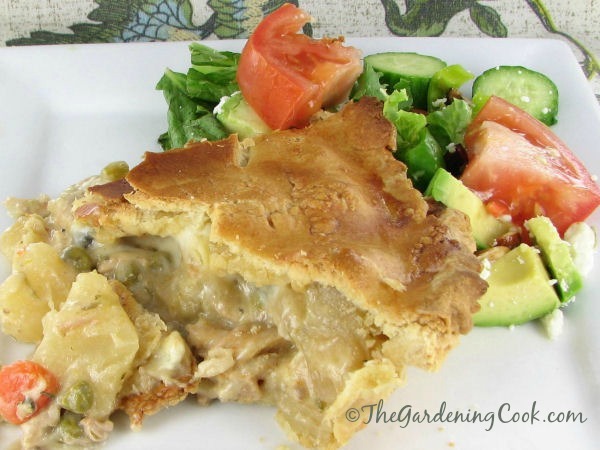 The cheese adds a richness to the pies and makes a nice thick gravy. 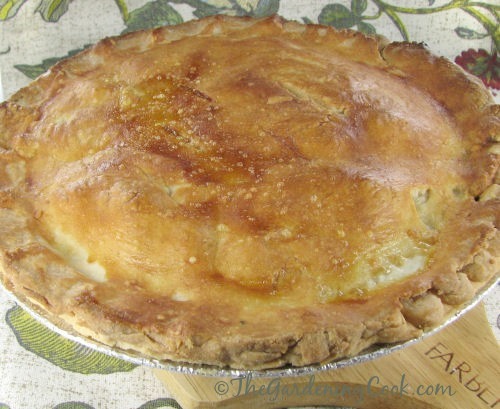 Top with pie crusts. I just used four deep dish pie shells. 2 for the bottom and 2 for the top. You can make your own pie crust, of course. Cut slits into the top crust to vent steam during baking. Cut excess crust from edges and pinch to seal. I ended up with two pies from this recipe. Brush with a whisked egg white and bake for 20-30 minutes until crust is fully cooked and golden brown on top. Serve with a tossed salad and freshly cooked garlic bread. If you have never used a crock pot, you don’t know what you are missing. Be sure to choose a large crockpot – 6 quart is what I use. It will feed about 7 people and will hold a 6 pound roast. 1-2 cups shredded cheese of your choice. I used Cabot Cheddar. 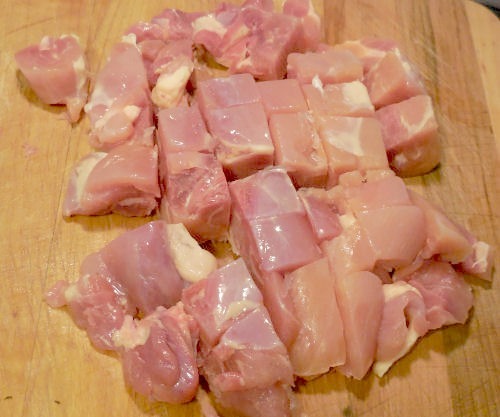 Partly defrost the chicken thighs and chop them into chunks while still slightly frozen. In Crock Pot, combine chicken pieces, potatoes, chopped vegetables, cream of mushroom soup, spices, and mix well. Add additional salt and pepper if desired. Cook on low for 6-8 hours until chicken is fully cooked. Use a sturdy spoon to break up the chicken after cooking if the pieces are not small enough for your liking. Add the heavy cream mixed with the arrowroot, and cook another 15 minutes. Meanwhile, preheat oven to 400 º F. Prepare pie crusts. Spoon chicken filling into the pie crust and top with the shredded cheese. 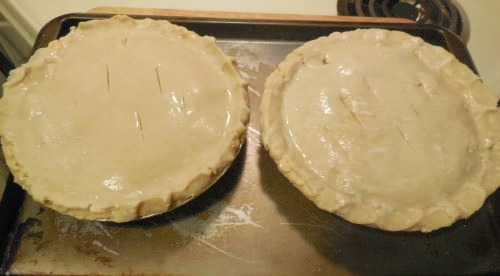 Place a pie crust on top and cut slits into the top crust to vent steam during baking. Cut excess crust from edges and pinch to seal. Brush with egg white and bake for 20-30 minutes until crust is fully cooked and golden brown on top.